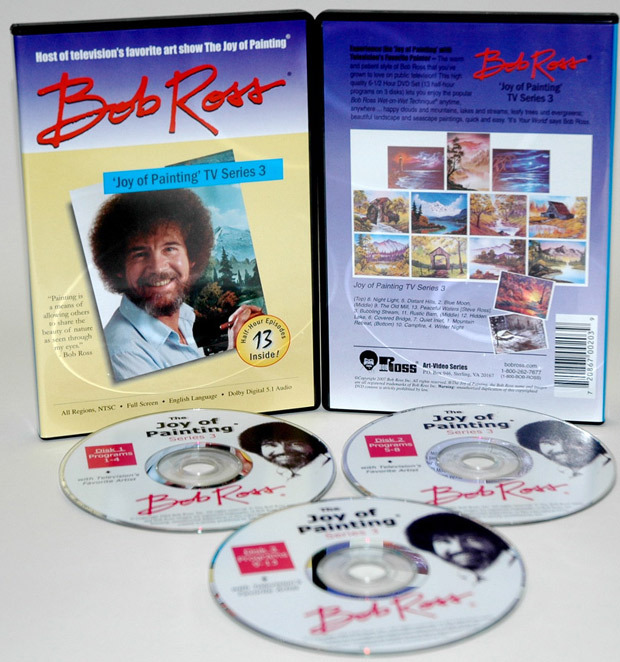 * Bob Ross Set Includes: Nine 1-Hour DVDs plus a Bonus Getting Started DVD (BR01D Peace Offerings, BR02D Winter Glory, BR03D Grandeur of Summer, BR04D Autumn Stream, BR05D Winter Harmony, BR06D Winter nocturne,BR07D Seascape/Lights, BR08D Times Past, BR09D Summer Reflection). * Bonus 'Getting Started' DVD...Includes: Preparing the Canvas, Sky and Clouds, Background, Evergreen Trees, Building, Foreground, Large Leafless Tree, Finishing Touches. * Summer Reflections, Chapters: Introduction, Preparing the Canvas, Sky and Water, Background, Middleground, Foreground, Large Trees, Finishing Touches. * Bob Ross ‘Getting Started’, Chapters: Introduction, ‘Mountain Summit’, English. Also: (voice & subtitles), Español, Français, Mandarin Chinese, Deutsch, Nederlands.